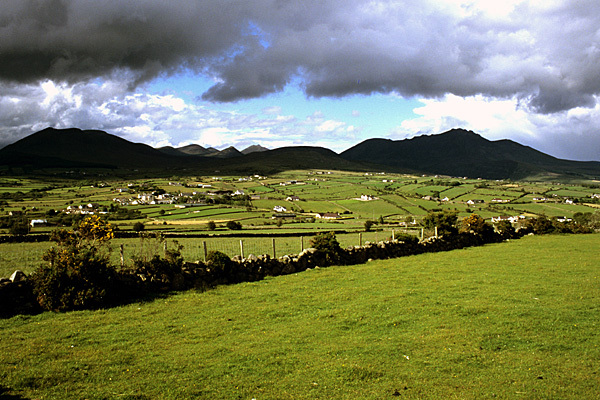 The Mountains of Mourne rise dark and brooding in this view from Aughrim Hill. 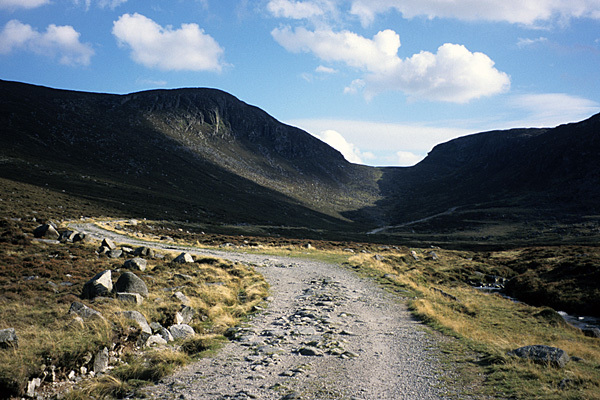 The Trassey Track is one of the most popular access points into the Mountains of Mourne. 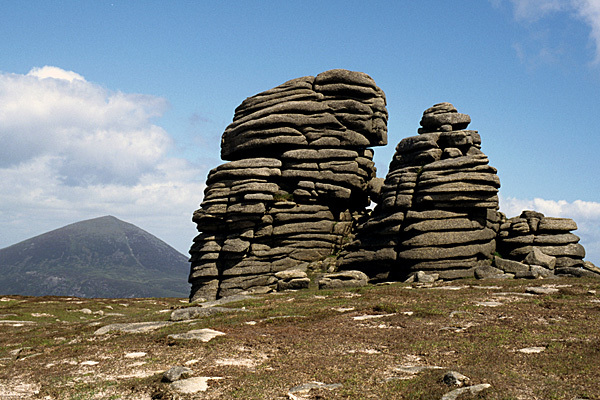 Granite tors rise along the crest of Slieve Binnian in the heart of the Mountains of Mourne. This book was first mooted by The O'Brien Press at a dinner following the launch of 'The Complete Ulster Way'. Once a contract was in place and time was allocated for the route research, the actual walking routes were checked over a period of three weeks. The Mountains of Mourne are a remarkably compact group and access is easy on all sides, so it was simply a case of choosing three separate bases and walking day after day until a comprehensive selection of routes had been checked. Local District Councils showed a great deal of interest during the period of research, with some access officers even walking with the author. The book contains 32 walks, from easy nature trails and forest trails to high-level mountain walks, including the mighty Mourne Wall walk. As the routes are confined within the Mourne AONB, there are a few walks out towards Slieve Croob. The book includes a four-day breakdown of the Mourne Way and Lecale Way, which are integral parts of the Ulster Way. In a review in Irish Mountain Log, Chris Avison said, "Paddy Dillon has chosen lovely walks which would be very hard to discover without his guide. The book is well presented and excellent value." In a review in TGO (The Great Outdoors) magazine, Ronald Turnbull said, "The Mournes have been looked at very closely indeed. The 32 routes, which also cover Slieve Croob and some low-level stuff, are comprehensive, clear and useful... You'll want to go to Ireland right now." The Independent newspaper listed The Mournes Walks first in a feature titled "The 10 Best Walking Guides".